The Connswater Community Greenway are delighted to be have reached the finals of the The National Lottery Awards. The National Lottery Awards are the annual search for the UK’s favourite National Lottery- funded projects, and they aim to celebrate the inspirational people and projects who do extraordinary things with NL funding across the UK. This summer the Scaffolding Project are running a 'Recycle School Uniform' campaign, building on the success of last year. Our last stall will be in Connswater Shopping Centre on Thursday 30th August, 10.30am-2pm so please come along and pick up some quality items. 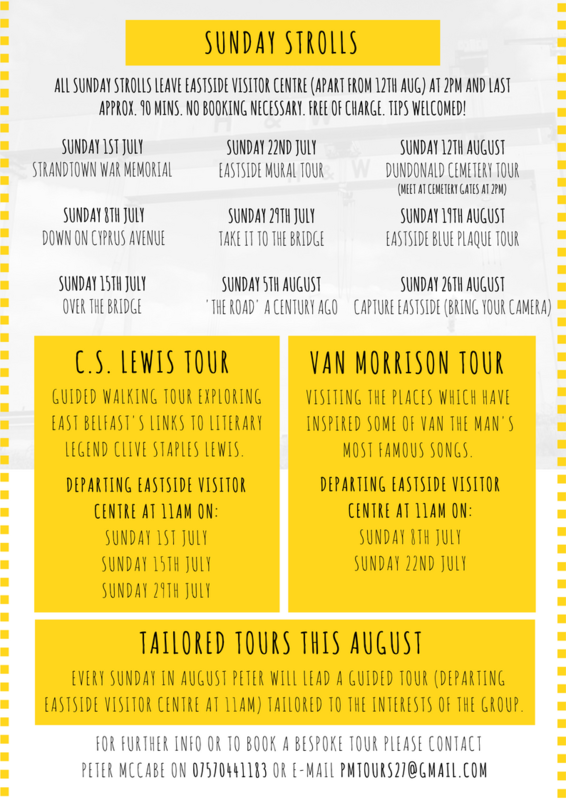 Local tour guide Peter McCabe is leading a number of tours during July and August. Lots of interesting topics will be covered that will be of interest to both locals and visitors. These are FREE but tips are welcome! We, along with The Holding Project, are hoping to develop the #EastBelfastHousingLab, a place to discuss and create new housing ideas, working with young citizens and local residents in East Belfast. We have been shortlisted for a Nationwide Building Society Community Grant. Young people in the private rental sector are in significant housing stress due to the limited availability of suitable and affordable housing. There needs to be a radical rethink on how these challenges are tackled in the future by placing the priorities of young residents at the core. The EastSide Arts Festival 2018 programme is now available to download (see link below). ... and the return of the Big Top! This year the Big Top will be on C.S. Lewis Square for 5 days with an exciting line- up of music, circus performance and even a baby rave! Connswater Community Greenway is hosting a Summer Fayre on C.S. Lewis Square on Sunday 24th June, 11am- 3pm. There will be stalls, face- painting, entertainment and much more. Keep up to date with the latest news on the Connswater Community Greenway Facebook event page. Contain Yourself, all has been revealed at Holywood Arches! EastSide Container Park is the latest addition to the east Belfast landscape. The previously derelict site at 392-400 Newtownards Road has been transformed with landscaping, planting, street furniture and shipping containers and today Landmark East, along with funders and partners, celebrated the completion of the project and full occupancy of the containers.